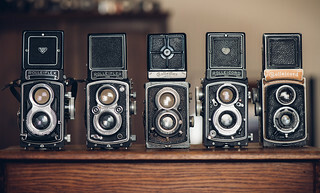 Rollei GmbH (originally Franke and Heidecke) is a German camera manufacturer with an impressive line of cameras and a history that is closely connected with the history of photography. They set the standard for TLR (Twin Lens Reflex) cameras and had great success with them, especially during the 1950s when almost every newspaper photographer used a Rolleiflex. 1920 Paul Franke and Reinhold Heidecke set up a little firm in Braunschweig (Brunswick), Germany. They start developing camera protoypes with Goerz lenses. 1921 Their first camera is launched, a stereo camera called the Heidoscop (clearly named after Heidecke, who designed it) with Tessar lenses. 1923 The Heidoscop is re-designed as a rollfilm reflex camera for 117 roll film. 1926 The new camera is marketed as the Rolleidoscop (alongside the plate/film pack Heidoscop, not replacing it). This is the first occurrence of the Rollei name. 1927 The first prototype for the non-stereo roll-film twin-lens reflex camera. 1928 Ten more prototypes are manufactured, nine of which have a Carl Zeiss Tessar F4.5 taking lens and the tenth a F3.8 Tessar. Decision is made to market both models simultaneously. 1929 The twin lens reflex camera, the Original Rolleiflex, is launched and an instant hit. The number of orders from all over the world is far above expectations. 1930 The great order stock and problems with sub-contractors force Franke & Heidecke to acquire a larger factory. This enables them to build 20,000 cameras annually. The Baby Rolleiflex prototype is finalized. 1931 The Baby Rolleiflex is manufactured. It has improvements that are later incorporated in the "full-grown" 6x6 Rolleiflex, such as a lever wind. 1932 The improved Rolleiflex model 620 is launched. It accepts 120 film and has a lever wind. 1933 The first Rolleicord - a less costly model, sold at less than half the price of the Rolleiflex. 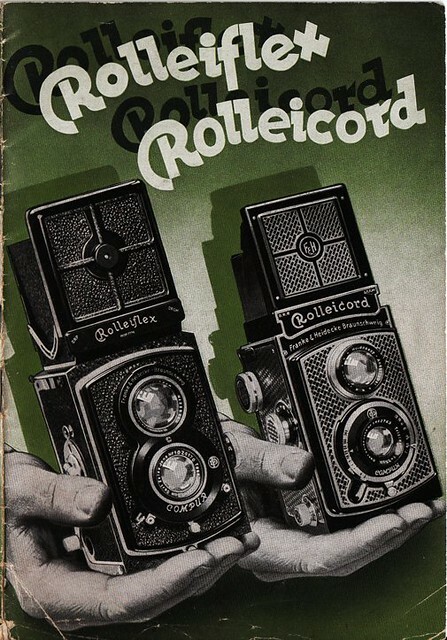 1936 The Rolleicord production line has been improved and the Rolleicord 1a is launched. Work is started on a new Rolleiflex production line. 1937 The new Rolleiflex Automat wins a Grand Prix at the Paris World Fair. 1938 The Rolleicord II is re-designed with a Triotar finder lens and a double bayonet mount on the taking lens. The Sports Rolleiflex is launched. 1939 All Rolleis are now fitted with the bayonet mount on both the finder and the taking lenses. 1939-45 During the war no new cameras are designed. The factory is damaged during bombings in 1944. 1946 The factory is rebuilt, but with difficulties since material is in short supply. 1949 New Rolleiflex and 'Cord production lines prepared. 1950 Rolleicord III is on sale with the Compur-rapid shutter, X synchronization, Schneider Xenar or Zeiss Triotar F3.5 coated lenses. The Rolleiflex Automat II is launched. Paul Franke dies on 18th March and is succeeded by his son, Horst Franke. 1951 The Synchro-Compur shutter replaces the Compur-Rapid on Rolleiflex. The Rolleiflex 2.8A is released. It has a Tessar F2.8 80 mm lens. 1952 Rolleiflex 2.8B is launched with a F2.8 Carl Zeiss Jena Biometar lens. 1953 Rolleiflex 2.8C is launched with a West German Schneider Xenotar lens. A range of accessories for the bayonet III is presented. 1954 The Rolleimarine under-water housing for the Rolleiflexes is designed. Rolleicord V and Rolleiflex MX-EVS are launched. For the first time a Zeiss Planar 2.8 is available for the Rolleiflex 2.8C. 1955 The Rolleiflex 2.8D with Planar or Xenotar and EVS system is launched. 1956 The Rolleiflex 3.5E and the 2.8E are available with built-in exposure meters. 1957 The Baby Rolleiflex is re-introduced. Rolleicord Va.
1958 Rolleiflex 3.5F with coupled exposure meter. Rolleiflex T.
1959 Tele Rolleiflex with Zeiss Sonnar F4 135 mm. Rolleiflex E2 (both 3.5 and 2.8) with removable hood. 1960 Reinhold Heidecke dies. Rollei Magic with automatic exposure. 1961 The Wide-Angle Rolleiflex with Zess Distagon F4 55mm. 1962 Company name changed to Rollei-Werke Franke & Heidecke. Rollei Magic II. Rolleicord Vb. 1963 Launch of the Rollei 16 for 12x17 mm. 1965 Rolleiscop home slide projector. 1966 Rolleiflex SL 66, Rollei's first single-lens rollfilm reflex camera. The Rollei 35 is presented as the smallest full frame 35mm camera. 1967 Production of computer flash units begins with models E60 and E66. 1968 cassette film SLR Rolleiflex SL26. 1969 Four Super-Eight cameras are launched. 1970 Rolleiflex SL35, the first 35mm SLR camera from Rollei. New factories at Uelzen and in Singapore. 1972 Rollei takes over the Voigtländer brand following the collapse of Zeiss Ikon. 1973 The Rollei P 66A, the first automatic 6x6 slide projector, is launched. 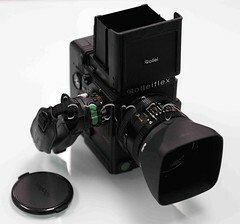 1974 Rolleiflex SLX, the first electronic MF camera system is launched. 2½ million Rollei 35 were sold. 1979 Company is renamed Rollei-Werke Franke & Heidecke GmbH & Co KG. Rolleiflex SL35 E is a new popular SLR. Production of TLR stopped; orders are filled by old stock. 1980 Rolleiflex SL 2000F, the first 35mm SLR camera with interchangeable magazine, double viewfinder system and integrated motor drive. 1982 After a bankruptcy petition and following deal, the company is reorganized as Rollei Fototechnic GmbH. 1983 1000 Rolleiflex 2.8F Gold Aurum are made. 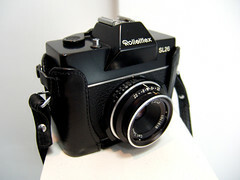 Rolleiflex 6006 is released as the successor of SLX with interchangeable backs. 1984 Rolleiflex 3003 35mm SLR. 1985 Rolleiflex 3000 P and 6002. 1986 RolleiMetric, a digital 3D industrial measuring system, is launched. 1987 New name again: Rollei Fototechnic GmbH & Co KG. The TLR is back with the Rolleiflex 2.8GX with TTL exposure and flash metering. 1988 Introduction of the Rolleiflex 6008 with a range of new fine lenses. 1991 Rollei enters digital photography with the Rollei Digital Scan Pack for the Rolleiflex 6008. The Prego AF is the first modern Rollei compact 35mm camera. 1993 A new generation of dissolve projectors, Rolleivision twin MSC 300, is introduced. 1994 The Rolleiflex 6003 without interchangeable magazine is an export hit. The digital imaging system is extended with the high-speed Digital ChipPack back. 1995 Launch of the Rolleiflex 6008 Integral. 1996 A new digital back, the DSP-104. 1998 Rollei presents the bellows camera system X-Act at Photokina. Rollei introduces APS cameras into its product range. 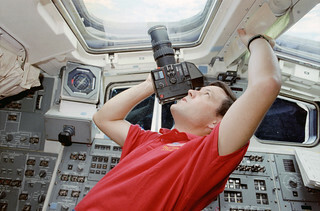 2001 Launch of five new compact cameras, AFM 35, a new series of dissolve projectors, and two new digital cameras. 2002 Launch of six new compact cameras, the Rollei d530 flex digital SLR camera, the Rolleiflex 6008 AF (the first 6x6 medium format camera with auto focus) and a new digital 35mm camera (Rollei d330 motion). Rollei also presents at Photokina the Rollei 35 RF (range finder-camera) and the Rolleiflex 4.0 FW (new wide-angle TLR camera). 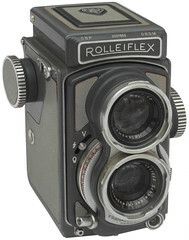 2007 Launch of the Rolleiflex 4,0 FT, a re-design of the 1959 Tele Rolleiflex. RCP buys the right to use the brand Rollei for its digital cameras. 2009 (March) Franke & Heidecke announced that it was going into insolvency, saying it couldn't pay its bills. 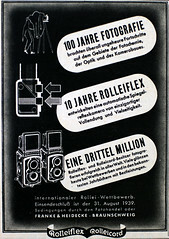 2010 DHW Fototechnik managed to relaunch the production of Rolleiflex, Rolleiflex Hy6 and Rollei 35. 2014 DHW Fototechnik filed for insolvency in August. The inventory went up for sale in April 2015. 2015 RCP, the Rollei brand rights owner, changed its name to Rollei GmbH & Co. KG. Parker, Ian. Complete Rollei TLR Collector's Guide. 1929 to 1994. Hove Foto Books, 1993. 180 pages. ISBN 1874031959. ↑ McKeown, James M. and Joan C. McKeown's Price Guide to Antique and Classic Cameras, 12th Edition, 2005-2006. USA, Centennial Photo Service, 2004. ISBN 0-931838-40-1 (hardcover). ISBN 0-931838-41-X (softcover). p850. This page was last edited on 3 February 2019, at 22:53.